WHEN I meet new people and they find out that I'm a paleontologist working for an oil company, the second question they ask (after "What is a paleontologist?") is usually "Why would an oil company hire one?" Most people think of dinosaurs when they think of paleontology, or at the very least trilobites and other invertebrate fossils. However, most of the rock samples available to those engaged in finding and developing hydrocarbon resources are in the form of "cuttings." Cuttings (Baker, 1979) are the small pieces of rock broken up by the drill bit and brought to the surface by the fluid which lubricates the drill bit and removes the cut rock from the bottom of the drill hole. If the bit encounters dinosaur bones or clam shells, they are so broken up in the process as to be almost unusable. Microfossils on the other hand, by virtue of their small size, can be recovered whole. Microfossils also happen to be abundant, especially in marine rocks which are the most common form of sedimentary rock in the crust of the Earth. Microfossils have many applications to petroleum geology (Fleisher and Lane, in press, Ventress, 1991, LeRoy, 1977). The two most common uses are: biostratigraphy and paleoenvironmental analyses. Biostratigraphy is the differentiation of rock units based upon the fossils which they contain. Paleoenvironmental analysis is the interpretation of the depositional environment in which the rock unit formed, based upon the fossils found within the unit. There are many other uses of fossils besides these, including: paleoclimatology, biogeography, and thermal maturation. There are a great number of different types of microfossils available for use. There are three groups which are of particular importance to hydrocarbon exploration. (The uses of microfossils in developing oil fields are analogous to those in exploration and so for brevity I will use the term exploration, which is looking for new resources, without the addition "development" or "exploitation" which refer to the drilling of wells to develop a field found by exploration.) The three microfossil groups most commonly used are: foraminifera, calcareous nannofossils, and palynomorphs. A brief introduction to each of these groups is included below. Many texts provide more detailed discussions of these and other microfossil groups (Haq and Boersma, 1978). Foraminifera (Figure 1) are protists that make a shell (called a "test") by secreting calcium carbonate or gluing together grains of sand or silt. Most species of "forams" are bottom- dwellers (benthic), but during the Mesozoic Era a group of planktonic foraminifera arose. These forms (Figure 2) were (and are) free-floating in the oceans and as a result are more widely dispersed than benthic species. After death, the planktonic foraminifera settle to the bottom and can be fossilized in the same rocks as contemporaneous benthic species. Benthic foraminifera tend to be restricted to particular environments and as such provide information to the paleontologist about what the environment was like where the rock containing the fossils formed. For example, certain species of foraminifera prefer the turbid waters near the mouths of rivers while others live only in areas of very clear water. These preferences are recognized by two methods: (1) studies of the distribution of modern foraminifera and (2) analysis of the sediments containing ancient microfossils. In the first case, if the modern species has a fossil record, one can reasonably assume that the fossil ancestors had similar modes of life as the living organism. However if the species in question is extinct, then one examines modern forms, inferring that the fossil forms had similar environmental preferences. In thelatter case, studies of the rock containing the fossils (sandstone, shale, limestone, etc.) give further clues to the environment of deposition. If a given species is always found in sandstones deposited in river deltas, it is not too much of a guess to suggest that this species preferred to live in or near ancient river deltas. If a company is drilling for oil in deltaic reservoirs, then such information can be very useful by helping to locate ancient deltas both in time and space. For instance, the delta for the ancestral Mississippi River during the late Pliocene was not southeast of New Orleans as it is today, but rather far to the west, south of the Texas-Louisiana border (Galloway et al., 1991). Calcareous nannofossils are extremely small objects (less than 25 microns) produced by planktonic unicellular algae (Figure 3). As the name implies, they are made of calcium carbonate. Nannofossils first appeared during the Mesozoic Era and have persisted and evolved through time. The function of the calcareous "plates", even in living forms, is uncertain. One extant group that produces "nannofossils" is the Coccolithophorans, planktonic golden-brown algae that are very abundant in the world's oceans. The calcareous plates accumulate on the ocean floor, become buried beneath later layers, and are preserved as nannofossils. Some chalks, such as those comprising the White Cliffs of Dover, are composed almost entirely of nannofossils. Figure 4 illustrates the tremendous size difference between the foraminifera discussed above and the calcareous nannofossils. Like the planktonic foraminifera, the planktonic mode of life and the tremendous abundance of calcareous nannofossils makes them very useful tools for biostratigraphy. The third and final group of microfossils to be discussed here are the palynomorphs (Figure 5). These are organic walled fossils and include fossil pollen and spores, as well as certain marine organisms such as dinoflagellates (the red algae which make up the "red tides" in modern oceans). Pollen and spores are transported by wind and water and can travel long distances before final deposition. They are surprisingly resistant to decay and are common as fossils. Because of the long transport before deposition, they usually tell us little about the environment of deposition, but they can be used for biostratigraphy. Fossil pollen and spores can also give us information about ancient climates. For example during the Ice Ages, the distribution of plant species on the North American continent was much different during glacial and inter-glacial times. These variations are apparent in the palynomorphs found in sediments deposited in the Gulf of Mexico during that time period (Davies and Bujak, 1987). Additionally, the organic chemicals which comprise palynomorphs get darker with increased heat. Because of this color change they can be used to assess the temperature to which a rock sequence was heated during burial. This is useful in predicting whether oil or gas may have formed in the area under study, because it is h eat from burial in the Earth that makes oil and gas from original organic rich deposits. Biostratigraphy plays a critical role in the building of geologic models for hydrocarbon exploration and in the drilling operations that test those models. The fundamental principal in stratigraphy is that the sedimentary rocks in the Earth's surface accumulated in layers, with the oldest on the bottom and the youngest on the top (Figure 6). The history of life on Earth has been one of creatures appearing, evolving, and becoming extinct (Figure 7). Putting these two concepts together, we observe that different layers of sedimentary rocks contain different fossils. When drilling a well into the Earth's crust in search of hydrocarbons, we encounter different fossils in a predictable sequence below the point in time where the organism became extinct. In our simplified case (Figure 6), the extant species C is present in the uppermost layers. Species B is only found in lower layers. The well does not penetrate any layers containing fossil A. The point at which you last find a particular fossil is called its LAD (Last Appearance Datum) (Figure 7). In a simplified case, the LAD in one sequence of rock represents the same geologic moment as the LAD in another sequence. These are our points of correlation between wells. Another well drilled in this area should penetrate the same sequence, but most likely at different depths than the original well. In addition to the LAD, another useful event is the First Appearance Datum (FAD). This may be difficult to recognize in a well, because rock from higher in the well bore may slough off the wall and mix with rock from the bottom of the hole. However, in studies of rock units exposed at the surface of the Earth and in some cases from well bores, these FADs are extremely useful biostratigraphic events. Lastly from Figure 7, one can recognize that the range of the three fossils overlap for only a relatively short period of geologic time. As a consequence, if a sample of rock contains all three (A, B, and C), it must have been deposited during this interval of time (Concurrent Range Zone). This is yet another "event" which can be used to subdivide geologic time into biostratigraphic units. By studying the fossils in many wells, a geologic model for the area can be built up. Around Denver, the mountains contain uplifted sediments equivalent to those buried beneath the adjacent plains. In this area one can study the rocks that crop out at the surface and predict what will be penetrated by drilling. In the Gulf of Mexico basin, where I work, the rocks we drill for oil and gas do not crop out at the surface. However, micro-paleontologists have been active in examining well cuttings for over 70 years and thousands of data points have been recorded. The database is good, but as we drill deeper wells and in greater water depths, we find new events. Micropaleontology continues to play a critical role in Gulf of Mexico drilling. Figure 8 shows an example of biostratigraphy's role in constraining geologic models. It is a seismic profile from the Gulf of Mexico offshore from Texas. The profile represents a line trending northwest to southeast, from near shore to deeper waters. These profiles are made by sending sound waves into the Earth and recording the echoes reflected back from the layers of rock. Analyzing these echoes using computers, profiles such as this are produced. The large dark line running diagonally through Figure 8, from the upper left to the lower right, is known as the Corsair fault. It is a large geologic feature, a normal fault that was active during the deposition of the surrounding sediments. The sediments to the right of the fault slipped downward, creating space for more sediment to be deposited than on the left side. The difference in thickness of layers along one of these growth faults can be more than a thousand meters. Because of the large variation in thickness across growth faults, microfossils are extremely useful in correlating time equivalent horizons from one side to the other. 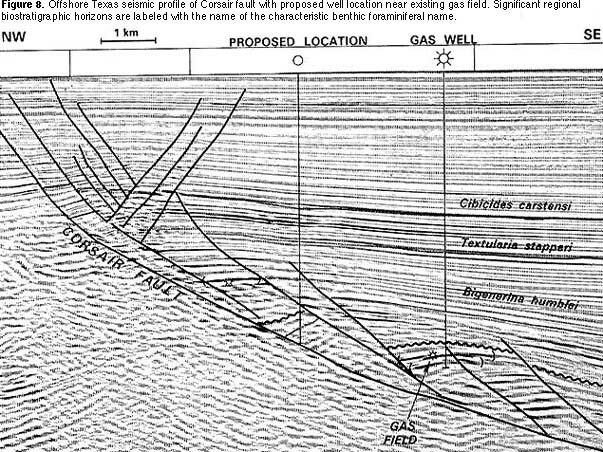 In the illustration, layers known to contain natural gas in the near-by well were projected into the proposed well using seismic correlation of biostratigraphically constrained horizons. Nearby wells have been drilled through the Corsair fault and the section beneath the fault is easily recognizable by distinctive benthic foraminiferal "marker species". The proposed well was drilled, but unfortunately did not find hydrocarbons. A micro-paleontologist on the drilling rig examined cuttings samples collected every ten meters during the drilling of the bottom 470 meters of the well. His workwas used to calibrate the small faults encountered while drilling near the large Corsair fault. The micropaleontologist was charged with ordering a halt to drilling if he observed fossils indicating that the Corsair fault was penetrated. The stopping point for the well was in fact determined using the observed microfossils. For paleoenvironmental analyses of Gulf of Mexico exploration, studies of the distribution of living benthic foraminifera (Poag, 1981; Pflum and Frerichs, 1976, Phleger and Parker, 1951) provide an excellent database. 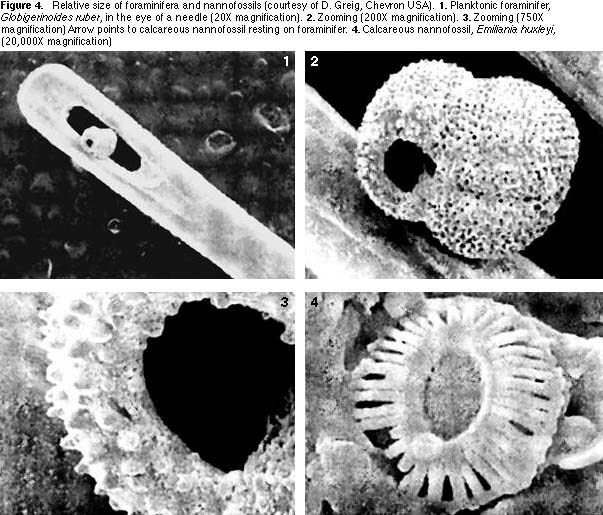 Using these studies and others, paleontologists constructed models for interpreting past Gulf of Mexico environments using fossil benthic foraminifera (Breard, Callender and Nault, 1993: Culver, 1988, Tipsworth et al., 1966). Wells drilled in Pleistocene and Pliocene age sediments encounter fossils of many extant species of benthic foraminifera and consequently paleoenvironmental interpretations are made with reasonable confidence. However, as wells are drilled deeper into older sediments, the percentage of extinct species encountered rises rapidly. In the older sediments paleoenvironments are more speculative, but can be inferred. Commonly in Gulf Coast paleontology, ancient marine environments are related to interpreted water depths (paleobathymetry). This is an oversimplification because benthic foraminifera often respond to water conditions (temperature, salinity, dissolved oxygen, etc.) rather than to depth. However, there are over 40,000 wells drilled in the Gulf. By combining data from existing wells, it is possible to reconstruct the profile of the continental shelf and slope at various points in geologic time. Such paleogeographic maps, combined with seismic profiles and other geologic data sets, are the tools used in the search for hydrocarbons. It is paleontology that uniquely explains the element of geologic time and depositional environment to petroleum geology. The author is grateful for help from Anne Hill (Shell Offshore Inc.) for preparation of the figures and to Dennis Greig (Chevron USA, Inc.) for use of his fine SEM photomicrographs. Thanks also to Mike Styzen and Al DuVernay of Shell Offshore Inc. for review of the manuscript. Baker, R. 1979. A Primer of Oilwell Drilling. Petroleum Extension Service, the Univ. of Texas at Austin, Austin. 94 pp. Breard, S.Q., A.D. Callender and M.J. Nault. 1993. Paleoecologic and biostratigraphic models for Pleistocene through Miocene foraminiferal assemblages of the Gulf Coast basin. Gulf Coast Association of Geological Societies, Transactions 43: 493-502. Culver, S.J. 1988. New foraminiferal depth zonation of the Northwestern Gulf of Mexico. Palaios, 3: 69-86. Davies. E.H. and J.P. Bujak. 1987. Petroleum exploration applications of palynological assemblage successions in the flexure trend, Gulf of Mexico. In Innovative biostratigraphic approaches to sequence analysis: New exploration opportunities. Gulf Coast Section Society of Economic Paleontologists and Mineralogists. p. 47-51. Fleisher, R.L. and H.R. Lane. (eds.). In press. Applied Paleontology, In E.A. Beaumont and N.H. Foster (eds. ), Exploring for Oil and Gas Traps, Handbook No. 3, Treatise of Petroleim Geology. American Association of Petroleum Geologists. Galloway, W.E., D.G. Bebout, W.L. Fisher, J.G. Dunlap, Jr., R. C. Cabrera-Castro, J. E. Lugo-Rivera and T.M. Scott. 1991. Cenozoic. In A. Salvador (ed.). The Gulf of Mexico Basin. The Geology of North America Vol. J. p. 245-324. Haq, B.U. and A. Boersma, (eds.). 1978. Introduction to Marine Micropaleontology. Elsevier, New York. 376 pp. LeRoy, D.O. 1977. Economic Microbiostratigraphy. In L.W. LeRoy, D.O.LeRoy and J.W. Raese. Subsurface Geology - Petroleum - Mining - Construction. Colorado School of Mines. p.212-233. Pflum, C.E. and W.E. Frerichs. 1976. Gulf of Mexico Deep-Water Foraminifers. Cushman Foundation for Foraminferal Research, Special Publication No. 14, 125 pp. Phleger, F.B. and F.L. Parker. 1951. Ecology of foraminifera, northwest Gulf of Mexico. Geological Society of America. Memoir 46, Pt 1. 1-88, Pt. 2, 1-64. Poag, C.W. 1981. Ecologic Atlas of Benthic Foraminfera of the Gulf of Mexico. Hutchinson Ross Publishing Co. 174 pp. Tipsworth, H.L., F.M. Setzer and F.L. Smith. 1966. Interpretation of depositional environment in Gulf Coast petroleum exploration from paleoecology and related stratigraphy. Gulf Coast Association of Geological Societies, Transactions 16: 119-130. Ventress, W.P.S. 1991. Paleontology and its application in South Louisiana Hydrocarbon Exploration, In D. Goldthwaite. (ed.). An Introduction to Central Gulf Coast Geology. New Orleans Geological Society p. 85-97.